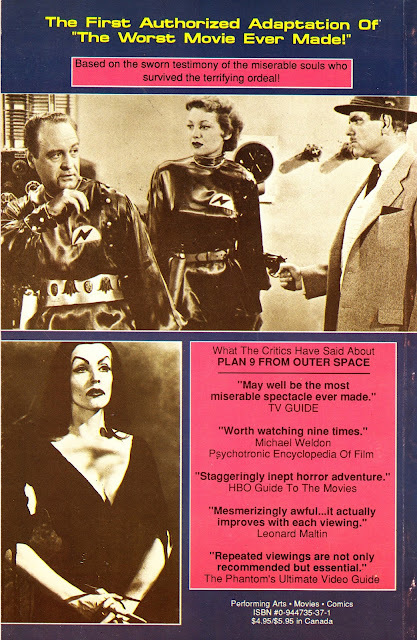 From Malibu Comics in 1991: Before the Ultraverse there was... PLAN 9 FROM OUTER SPACE. This is the first - and to my knowledge only - official comics adaptatiin of the notorious Ed Wood cinematic clunker. I never really understood the point of this one (which clearly didn't stop me grabbing a copy) because the joy of the film is in the watching and its plentiful shortcomings can't really be translated to print. But it remains a fun Star Age oddity looking back to a bygone time. Flying saucers over Hollywood indeed. This also links back to the previous post... The launch issue of HOTDOG MAGAZINE had an article on "buying your first DVD" (hohum) and - weirdly - PLAN 9 wss the first DVD I bought... because I wanted the companion documentary. Which was actually longer than the film itself. From July 2000: the first issue of British movie magazine HOTDOG. This one ran for 83 issues and shuttered at the end of 2006. The editorial agenda was a mix of the modern and iconic classics. 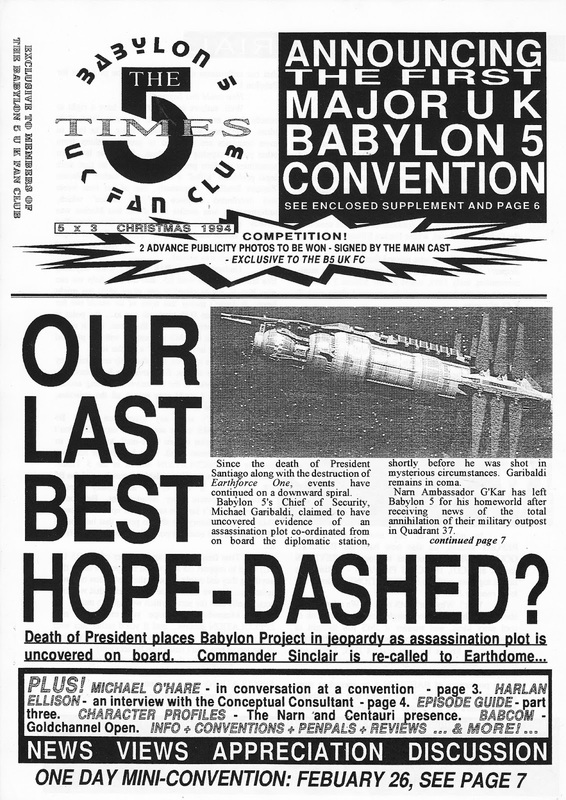 From Christmas 1994: the third issue of THE 5 TIMES, newsletter of the BABYLON FIVE UK FAN CLUB. From sometime after 1977: THE PROFESSIONALS OFFICIAL POSTER MAGAZINE, part of the TV SUPER HITS series, based on the LWT production for ITV. This is Number 4 is the series but I suspect the numbering belongs to TV SUPER HITS rather than specifically the fourth issue dedicated to this series. I'm sure I've seen issues devoted to other shows (the edition I spotted on display, for a price I wasn't willing to pay, featured THE DUKES OF HAZZARD) so I suspect this was a flexible umbrella title that allowed the publisher to target whatever show looked hot at that moment. Network are currently releasing the show on Blu Ray disc... and the season box sets are well worth snapping up. Not only do the shop-on-film episodes look gorgeous in their fully restored glory (I doubt the prints have ever looked so fine... the restoration work is amazing) but each set also comes with an incredibly detailed book by Andrew Pixley devoted to the making of each season. Londoners will also delight in some gosh-hasn't-it-changed location spotting as well. From 1994: the softcover DWB INTERVIEW FILE, a collection of the best interviews (with a predictable bias to all things WHO) from the first 100 issues of DWB/ DOCTOR WHO BULLETIN. This was published alongside the black-covered Compendium (see previous post) and - between them - make for a great overview of the bulk of the fanzine's run (it continued for a bit longer but then rebooted into DREAMWATCH... and began to loose its edge somewhat). 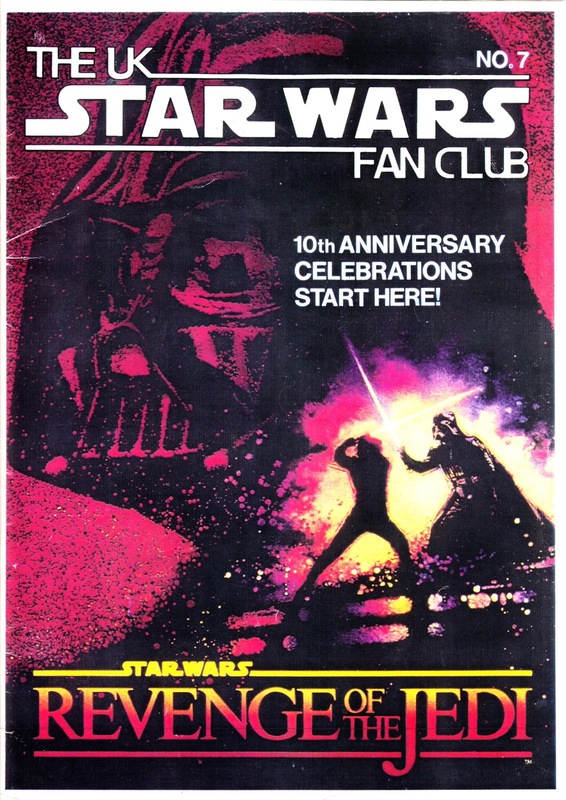 From Spring 1993: the seventh issue of Britain's unofficial UK STAR WARS FAN CLUB magazine, celebrating the tenth anniversary of REVENGE RETURN OF THE JEDI. 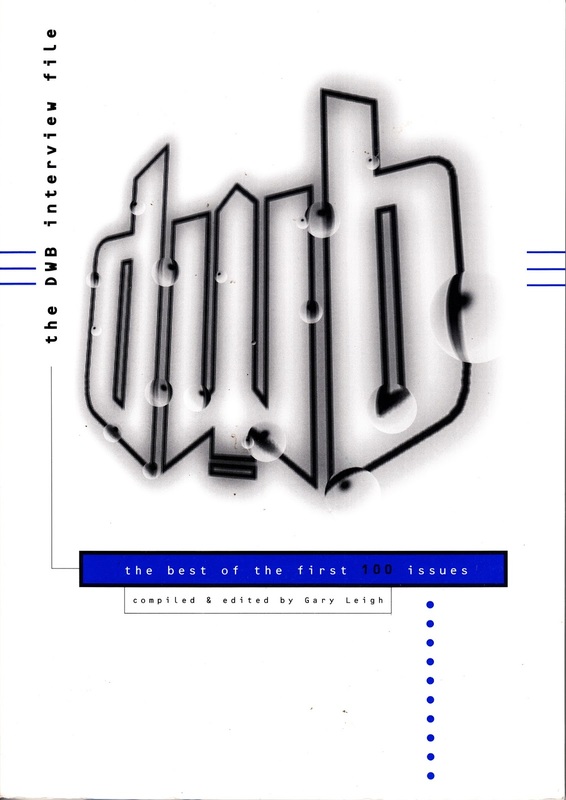 From 1993:THE DWB COMPENDIUM - THE BEST OF DWB, a softcover book collecting many of the best articles and features (some updated or - at the very least - with new formatting and layouts to compensate for the mag's sometimes primitive production values) from the fanzine/ magazine's first 100 issues in print. This - and the companion compilation of the best interviews - were offered for sale through the magazine and (I think) through shops as well. I have an idea that I picked up my copies several years later as remaindered stock. DWB itself was still trying to shift unsold copies way into the DREAMWATCH era. Copies seldom seem to surface now (although I don't attend any WHO conventions... which may be awash with copies for all I know) which suggests that limited initial interest has translated as scarcity in the secondary market. Both are well worth grabbing if you find copies. The emphasis is on WHO (of course) bua t there is enough other telefantasy in both to generate a bit of diversity. From 1986: 2000AD's DICEMAN bows out with its final offering... You Are Ronald Reagan! Yes indeed. 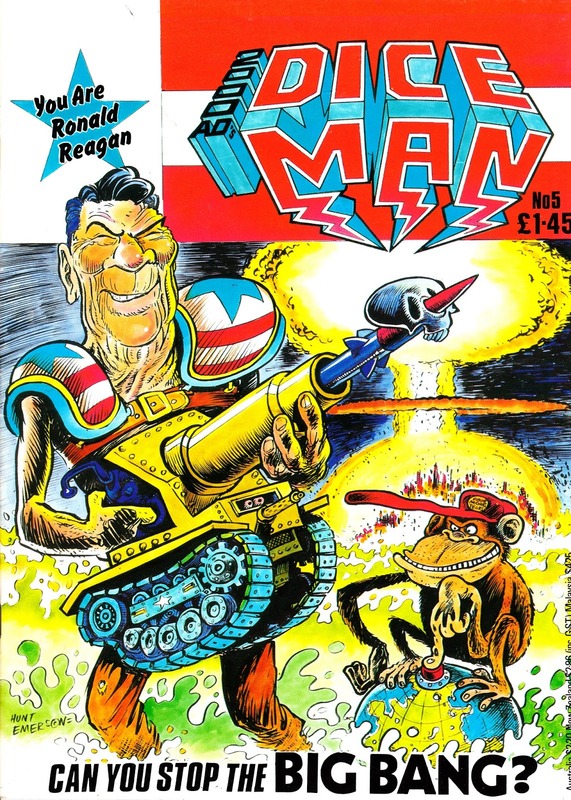 As I've said before, I put DICEMAN's failure down to the whopping cover price (way above the weekly or IPC's holiday specials), sporadic scheduling (although the issues were given hefty promotion in 2000AD itself which did at least alert readers thst the new issue was due) and some random racking by newsagents which saw it flip-flop between the bottom shelf and buried with the hobby magazines. These were the days before comics would legitimately make a land grab for space on the upper shelves. Nevertheless, it was a bold experiment which did - at the very least - explore the different ways Tharg's growing stash of intellectual property could be deployed in different creative ways. Anyone for You Are Donald Trump? From 1993: the third and final issue of Starlog's STAR WARS TECHNICAL JOURNAL, dedicated to the tech and hardware used by the forces of the Rebel Alliance. I'm not quite sure how Leia's slave girl outfit ticks the tech box but presumably the edit was apply the same logic thst demands beautiful ladies must be photographed close to inanimate hardware. 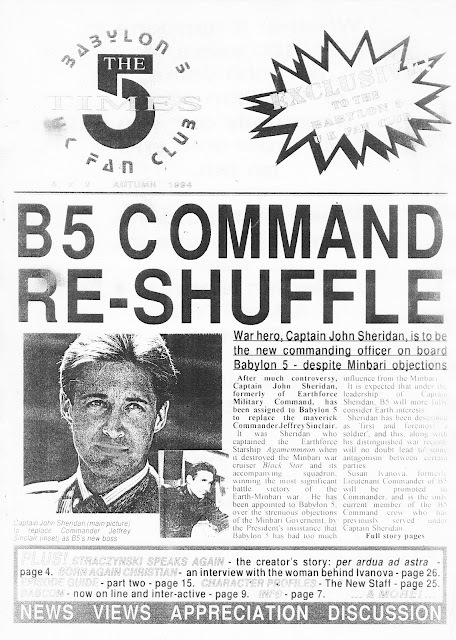 From June 1995: A rare opportunity to put a poster of men in military uniform on your wall... and use your love of a cult TV show as total justification. 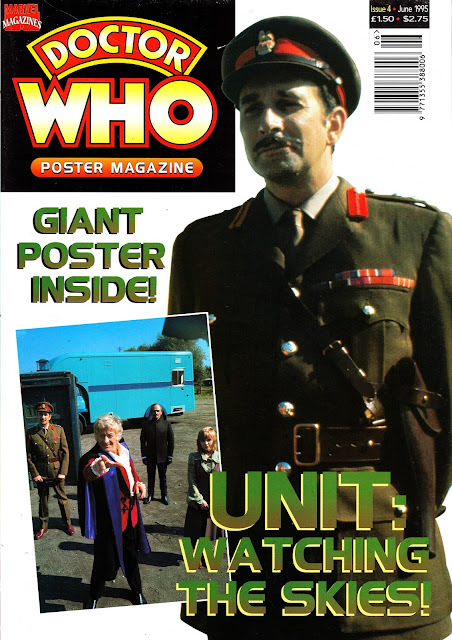 The fourth issue of DOCTOR WHO POSTER MAGAZINE turns its attention to U.N.I.T. From October 1993: the first issue of Fleetway's CAPTAIN SCARLET revival, timed to coincide with the arrival of reruns on BBC TWO. The series had last been seen in the UK roughly a decade esrlier when ITV had bought a package of Gerry Anderson shows (including Thunderbirds, Stingray, Scarlet, Joe 90 and even Fireball XL5) to play in daytime and at weekends. The BBC were able to make a similiar deal in the early 1990s because ITC were no longer affiliated to ITV and were free to seel their back catalogue of ATV/ ITC series and movies to any UK broadcaster (a large package wss also sold to cable/ satellite outfit Bravo). Latterly they returned to the fold when Carlton acquired the business. The Fleetway fortnightly comic, which used strips originally created in the 1960s, ran for only 14 issues before folding into the pages of THE NEW THUNDERBIRDS COMIC from issue 67 (May 1994). 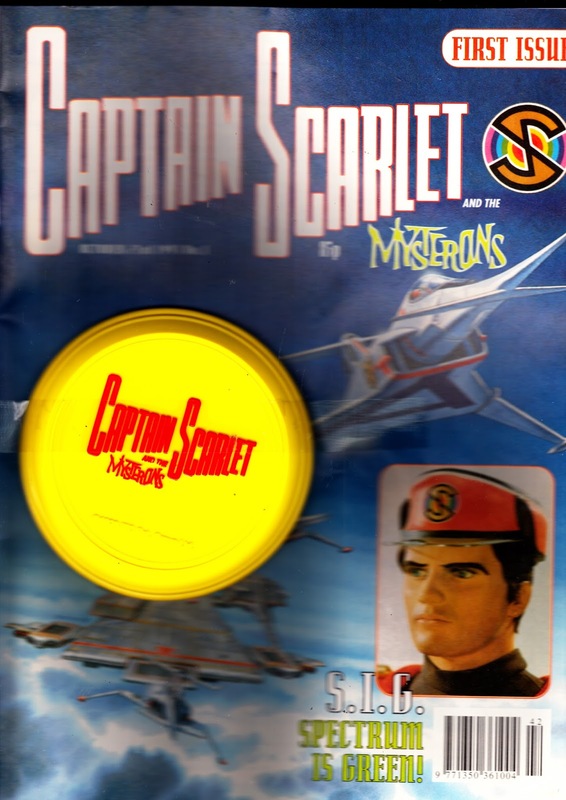 Scarlet returned to comics in 2005 to tie-in with the CGI revival. Poor scheduling of the TV show also helped the seal the early fate of the new title. 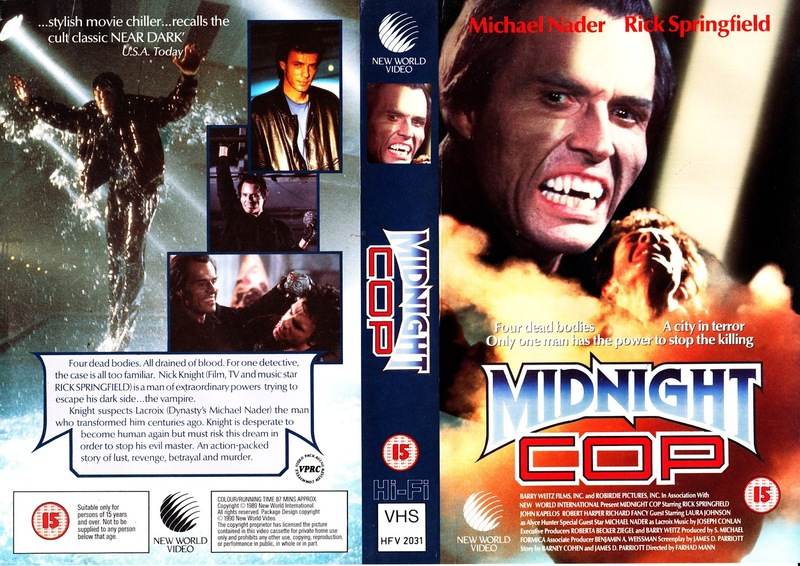 From 1989: the UK rental release (aka 'big box') of MIDNIGHT COP (aka NICK KNIGHT) from NEW WORLD VIDEO. This stylish tele-flick was a pilot for what would have been a regular US drama about a night shift cop who just happens to be a vampire. Unfortunately, the tele types bounced the idea of a hero who was also undead and the Rick Springfield (memorable for his early departure from the good ship GALACTICA a decade earlier) vehicle stalled. Except. It didn't. The concept was reworked - and recast - and rebooted as the late night cheap-as-chips cult drama FOREVER NIGHT. New World Video repackaged as much of the US studio's TV work as possible for the UK rental market. And this was no exception. There was no rental release and it seems to have been all but forgotten in the digital era (although FOREVER KNIGHT did get some R1 box sets way-back-when. It's a good watch and - for my money - betger than the series. From Autumn 1994: the second issue of the fanzine/ newsletter THE 5 TIMES, published by the UK BABYLON FIVE FAN CLUB, reports on the cast changes between the show's first two seasons. 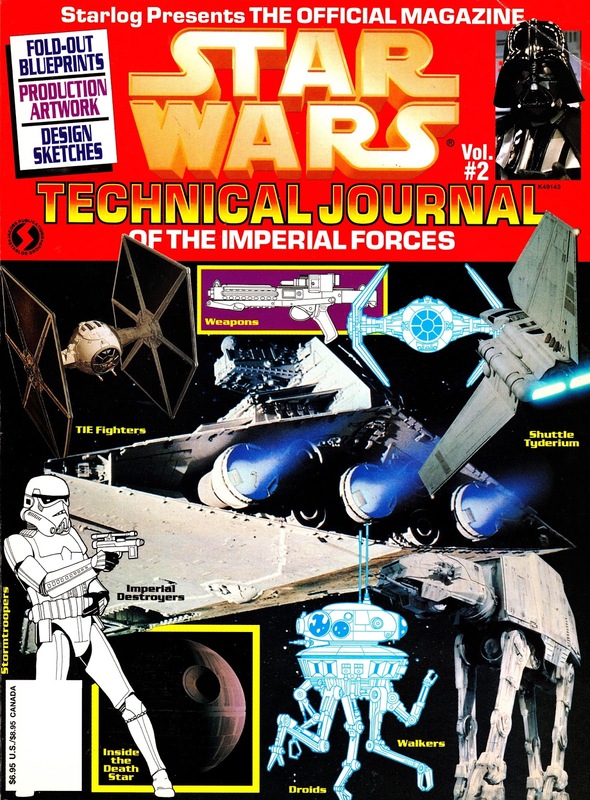 From 1993: the second (of three) issue of STAR WARS TECHNICAL JOURNAL, dedicated to the Imperial war machine. 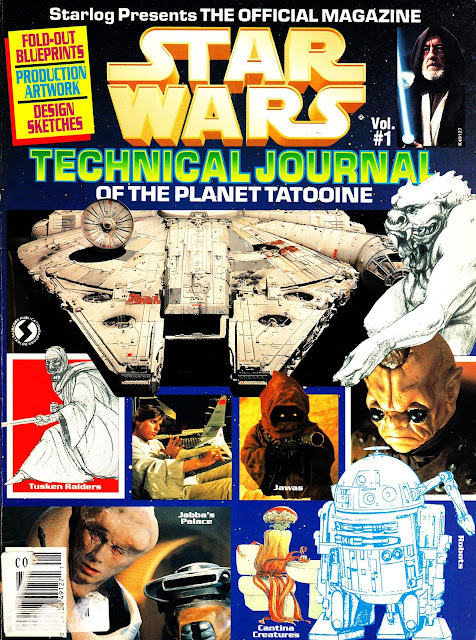 These were a series of squarebound mags (we'd probably call them bookazines today) with various gatefold pages inserted between yer more usual vertical A4 (or thereabouts) pages. The all-new content overlapped with the similar in-universe stuff being pioneered by West End Games, although the Lucasfilm continuity police were presumably keeping things consistant. I'm not expert enough to know for sure. 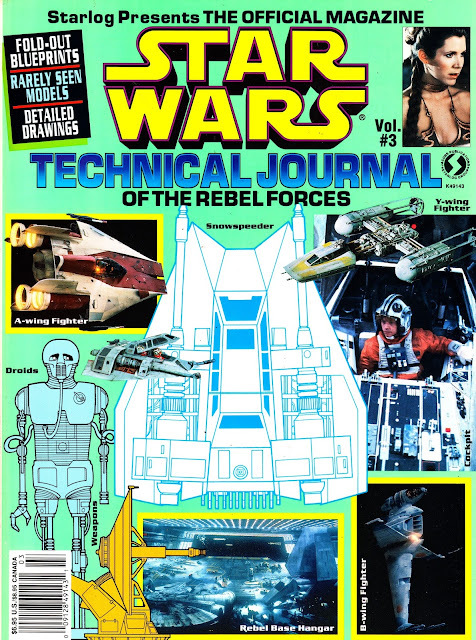 The third volume - which I'll post soon - covered (surprise) the hardware of the Rebellion. The content of all three were subsequently collected into book form. The UK edition was from Boxtree and I have a battered copy somewhere. 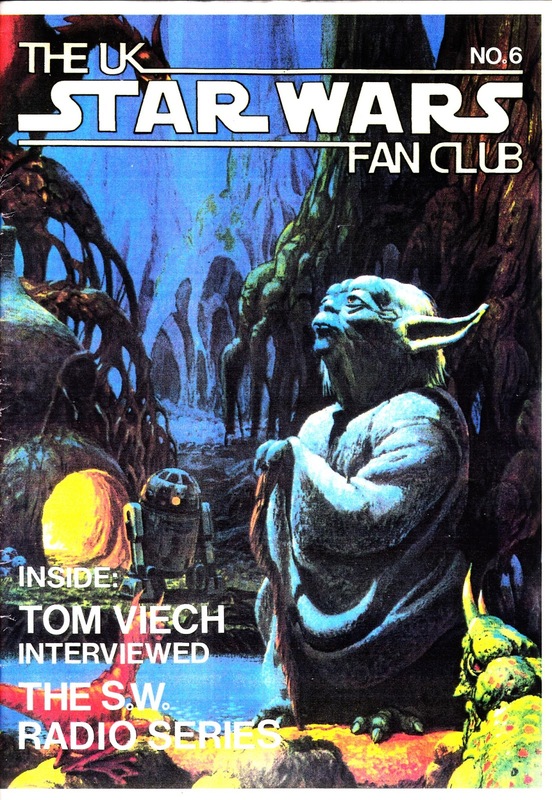 The first edition, published the same year, and featured in a previous post, covered Tatooine. 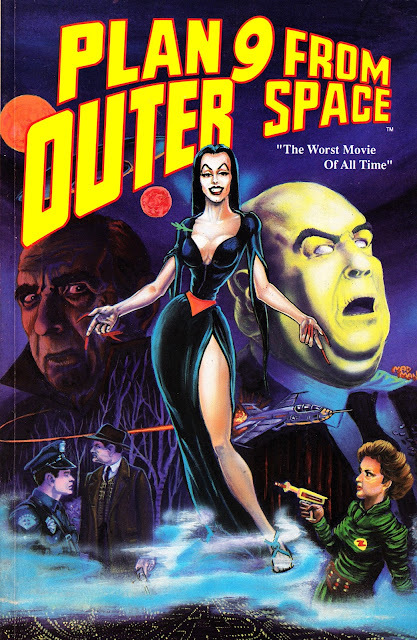 From 1978: OUTER SPACE, a one-shot (?) 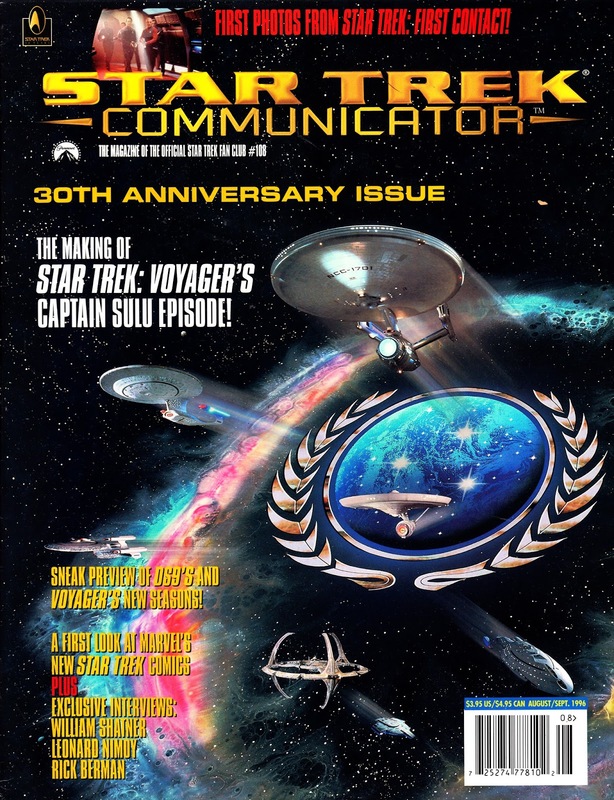 quickie entry into the SF magazine genre, spawned by the success of you-know-what. It's a British title published by an outfit called Rathbourne. I stumbled across this copy recently, the one-and-only time I have ever seen it. The cover is very "that'll do" but the contents were OK considering the undemanding times they appeared in. 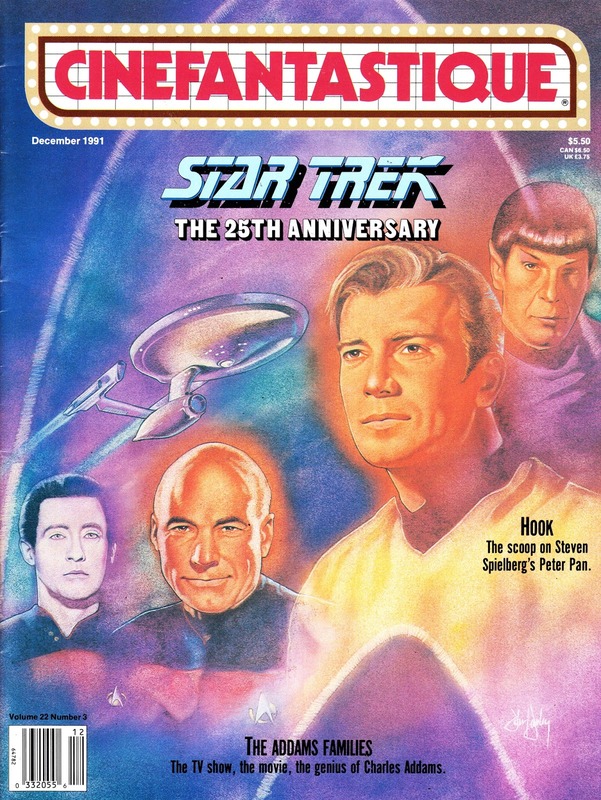 From December 1991: CINEFANTASTIQUE magazine celebrates the 25th anniversary of STAR TREK. 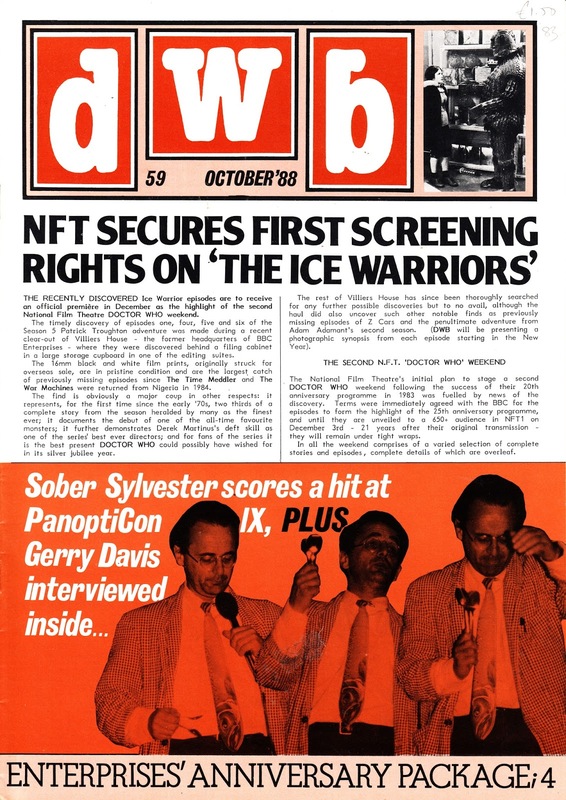 From October 1988: DWB (formally DOCTOR WHO BULLETIN and predecessor to DREAMWATCH issue59. 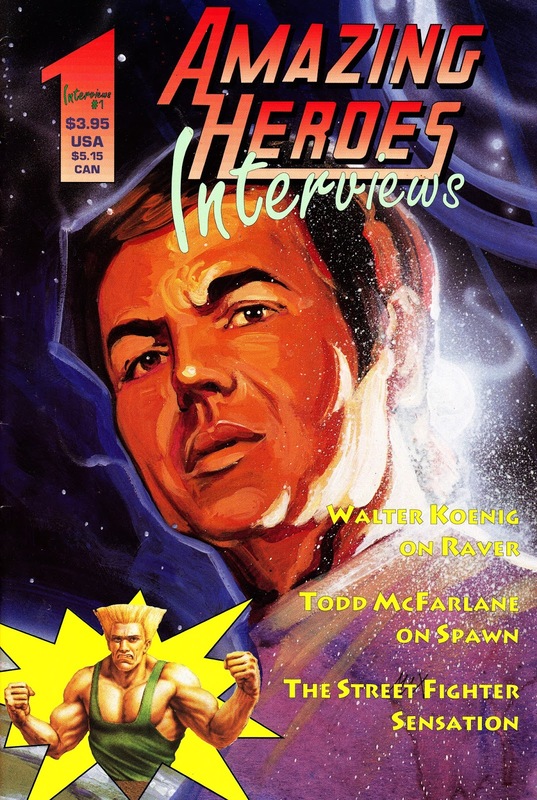 From 1993: Walter Koenig keeps the cash coming in between STAR TREK movies by penning RAVER, a three-issue comic book oddity from Malibu Comics. 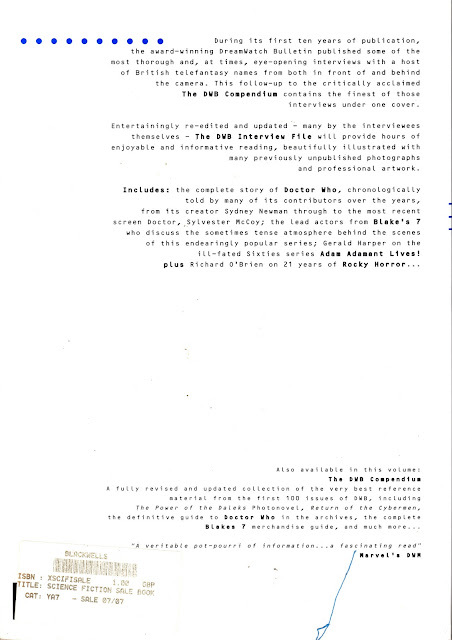 Koenig had previous for lending his writing star power to an episode of Trek's animated series (compensation for being squeezed out of the cast for financial reasons: Filmation couldn't afford to reunite the entire live action cast and Chekov - as a latecomer - was deemed least essential), his well-worth-reading behind the scenes account of the making of THE MOTION PICTURE (his updates also appeared in the early issues of STARLOG) and a standalone Chekov tale (notable for being set in thst nebulous period after TMP) for the first run of the DC Comics Trekathon. Malibu (note the logo change mid-run) went on to gobble up the DS9 and VOYAGER (although the latter appeared under Marvel's banner post takeover) comics rights and their brief but prosperous run included several Trek celebrity contributors. I can't claim to have actually read these but I spotted them in the 50p bin and thought they were too tempting a target to pass up. I'm not sure if the title meant the same thing in the States as here in the UK... but it seemed an odd choice to me. From June 1993: AMAZING HEROES tries (and broadly fails) to find a new niche in the changed comcs press landscape by returning (the regular run ended in June 1992 after 204 issues) with a new remit: longform interviews. 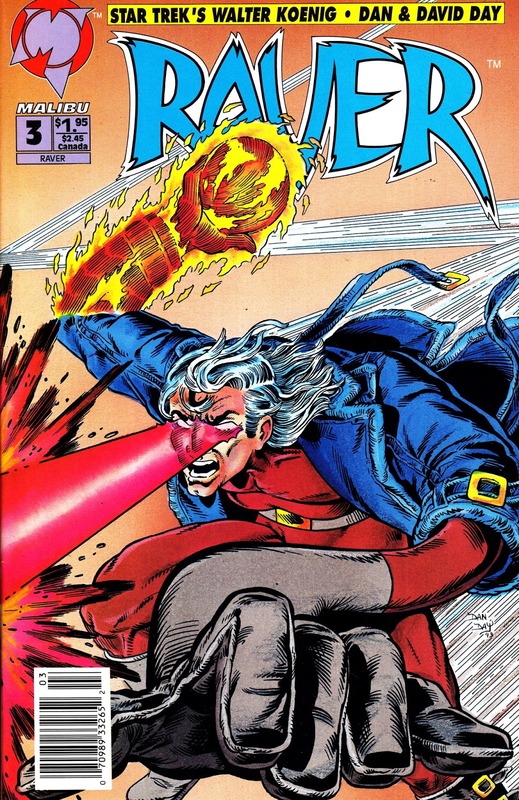 The reboot moved it out of the territory thst had been captured by WIZARD, HERO ILLUSTRATED and all the wannabes but placed it in direct competition with the (already struggling) COMICS INTERVIEW. That long-runner folded after 150 regular issues in 1995. 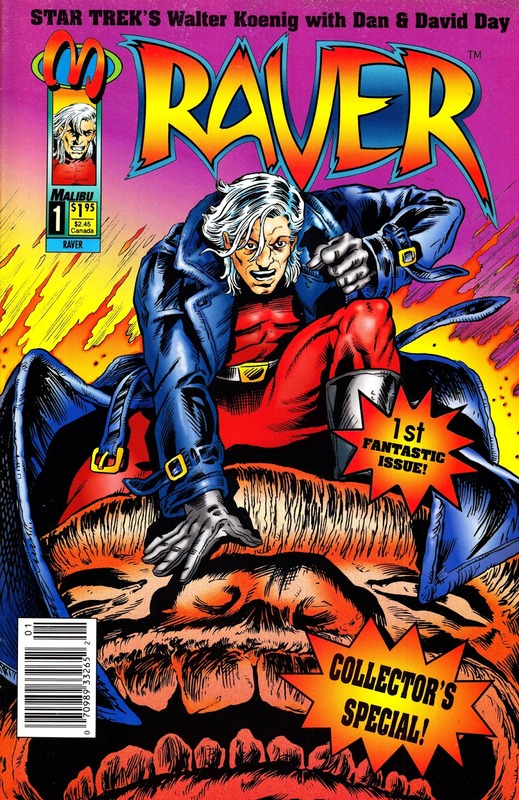 Only four issues of this revival made it into print. 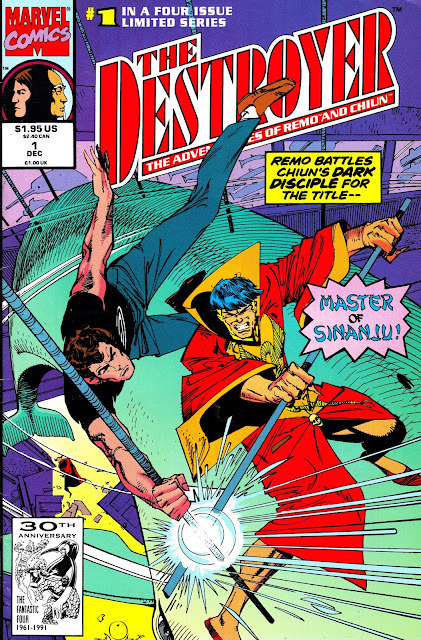 Subjects festured in the rest of the run included Todd McFarlane (2), Jim Shooter (3) and Trek's DeForest Kelly (4). 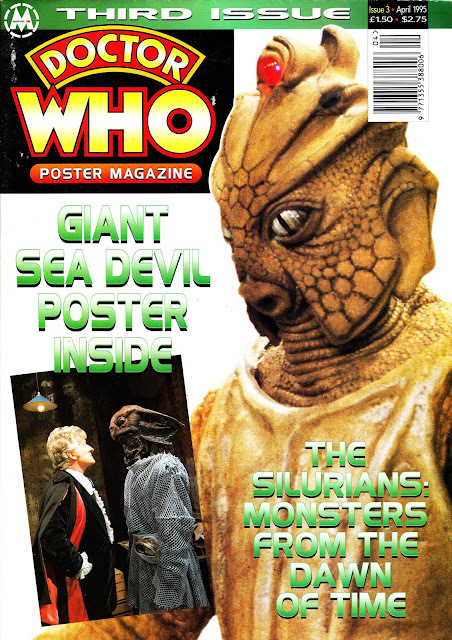 From April 1995: the third issue of MARVEL UK's DOCTOR WHO POSTER MAGAZINE, dedicated to those dwellers of the depths (of the Earth and the oceans) the Sea Devils and the Silurians. 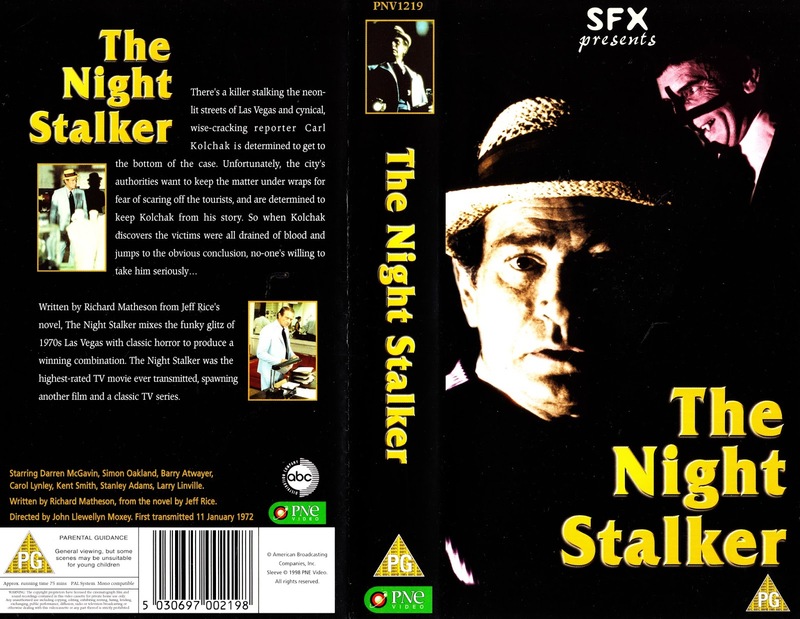 From 1998: one of the UK VHS releases of the original TV Movie THE NIGHT STALKER (which spawned a sequel and the legendary one-season-wonder KOLCHAK THE NIGHT STALKER). What's interesting about this, and the companion release of the sequel, is that they were released as SFX PRESENTS, a promotional tie-in with the magazine. However, these were normal sell-through tapes and not given away with the magazine or anything fancy (or generous) like that. Although SFX may have offered them mail order at a reasonable price. Mine were store purchased. From the autumn of 1992: the sixth issue of THE UK STAR WARS FAN CLUB magazine. 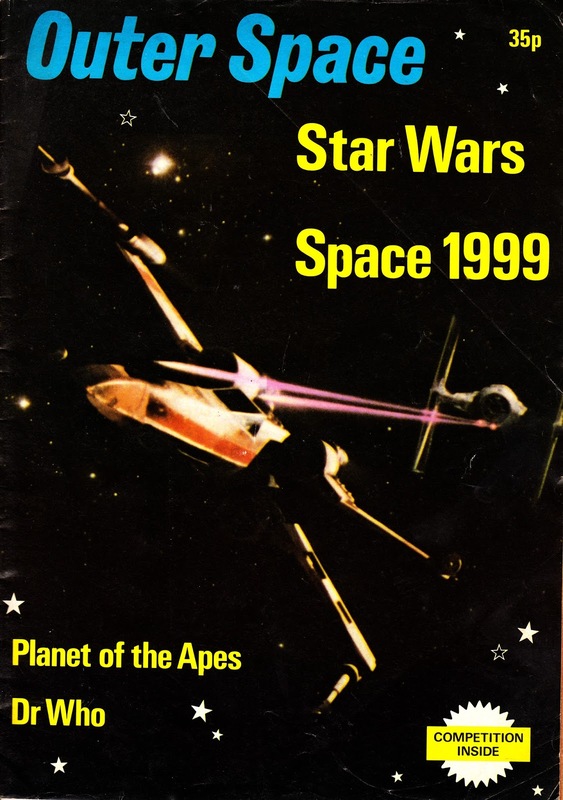 Once again, this contained articles on aspects of the saga (like the radio adaptations, as played on BBC RADIO ONE) that received scant attention pre-internet and pre the myriad of magazines that started popping up a few years later. 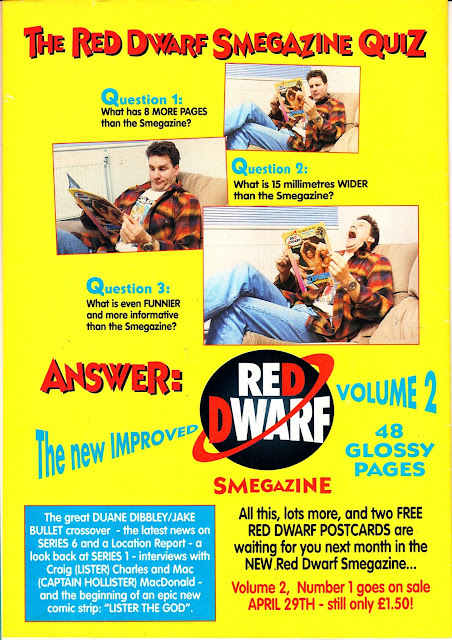 From January 1994: the last issue of the last volume of Fleetway's RED DWARF SMEGAZINE: Volume 2, issue 9. At least the publisher had the good grace to actually publish a finale. An extended 64-page goodbye no less. This was, no doubt, to ensure that all material commissioned and completed for issue 10 and beyond was actually published rather than written off when the license was dropped. Gone were the days when Marvel would tart up an old Tarzan tale as an issue of BATTLESTAR GALACTICA. 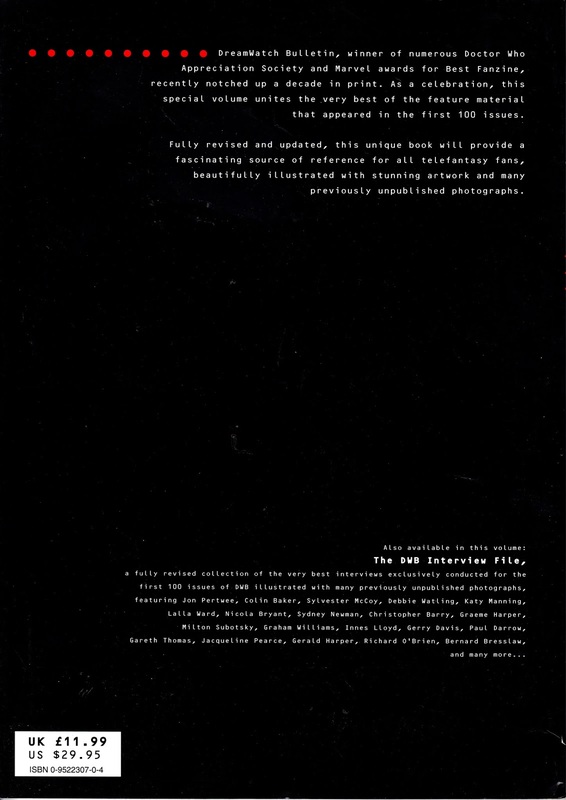 The cancellation wss probably down to the adult (and teens) property sitting uncomfortably in Fleetway's portfolio of titles pitched at a much younger audience. Its magazine/ comic hybrid status probably didn't help. 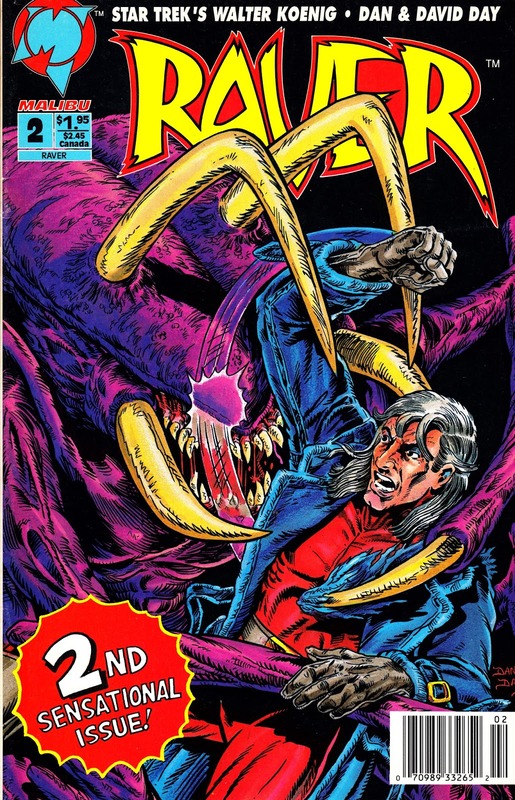 That said, it's surprising that Marvel UK (who did, after all, grab THE GLAM METAL DETECTIVES) didn't add the property to their briefly booming line of licensed magazines. RED DWARF continued on TV of course. Although I'm not a fan so I wasn't watching. From May 1993: The RED DWARF SMEGAZINE blasts back with a rebooted second volume which capitalised on the transition from comic to magazine (with comic strips) that took place across the first fourteen issues. 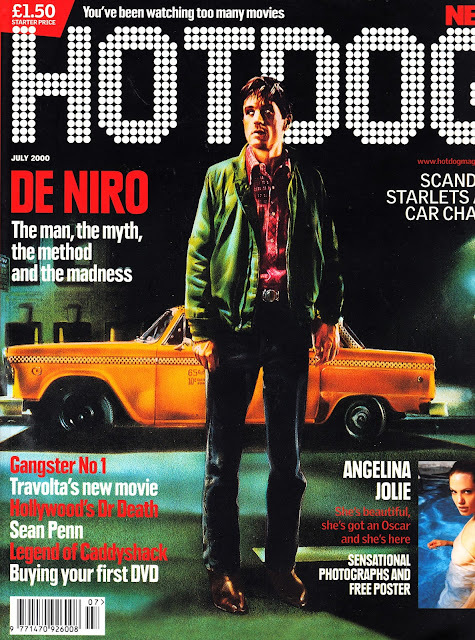 This boasts one of the most unfortunate (in retrospect) cover lines to grace a genre mag. It came with a couple of free postcards... which had long-since parted company from this 20p back issue. 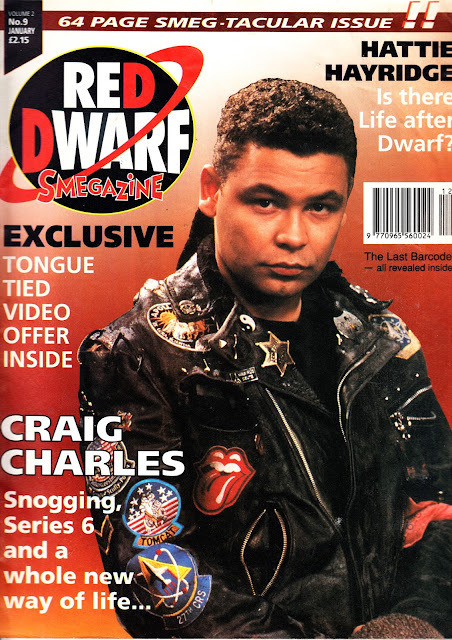 From April 1993: the first volume of the RED DWARF SMEGAZINE (formally MAGAZINE) bows out after 14 issues. But it wasnt't the end... a reboot was on the way. 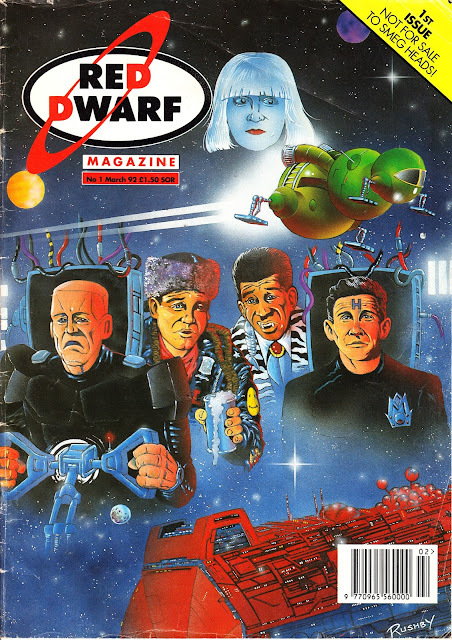 From March 1992: the first issue of Fleetway's RED DWARF MAGAZINE. The cureent issue of SFX boasts a loosely-inserted RD "magazine"/ puff-piece to promote the show's return (today?) to UKTV with another run of new first-run episodes. I use inverted commas becuase - lets be honest - booklet (or leaflet) would be more accuate. Buyer beware: it may have already fallen out of your copy before you even pick it up off the shelf. Anyhow, this seemed like a good hook to dredge up the first issue of the real magazine. 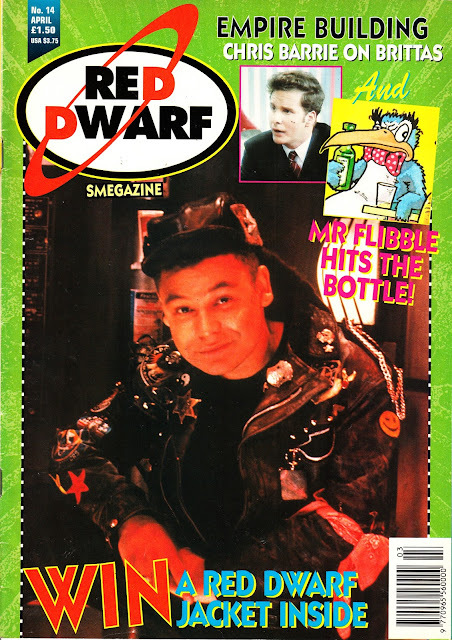 This - and its successor the Smegazine - was an odd (and sometimes uncomfortable) mix of humour, comic strip and behind-the-scenes reportage more akin to thst found in genre mags covering drama. Despite the show's continued presence during this period - and a boom in VHS, book and merchandising sales - Fleetway couldn't quite get this to work. 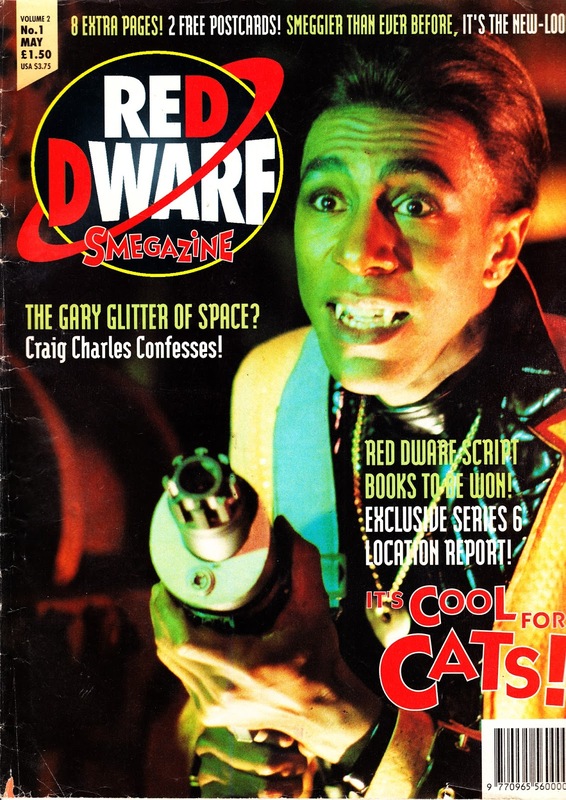 The first volume (which became the RD Smegazine from the third outing) clocked up 14 issues. 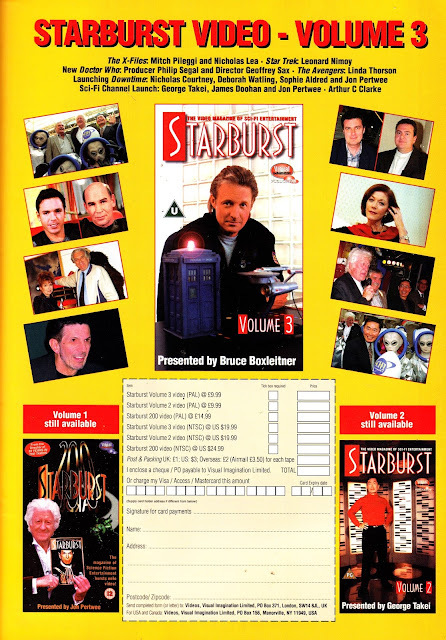 A reboot added a further nine issues (including an extended goodbye to ensure all commissioned inventory saw print) for a total of 23 editions. Sales were apparently healthy but the contents and the readership didn't sit well with the publisher's new priority of targeting the younger end of the market with licensed properties. I was never a massive fan of the show (although I saw all the early episodes thanks to my friend's VHS collction and a few more when I was at Uni) so i didn't grab any issues of this at the time. I've stumbled across a few since (this battered copy set me back 20p) and picked them up to add to the STARLOGGED vault. 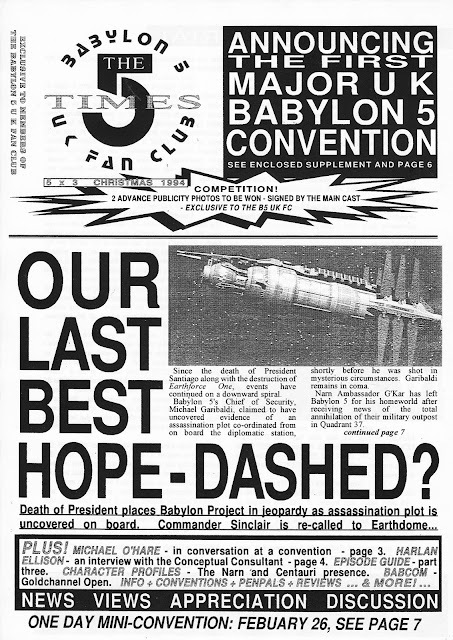 From the summer of 1994: the first issue of THE FIVE TIMES, published by THE UK BABYLON FIVE FAN CLUB. 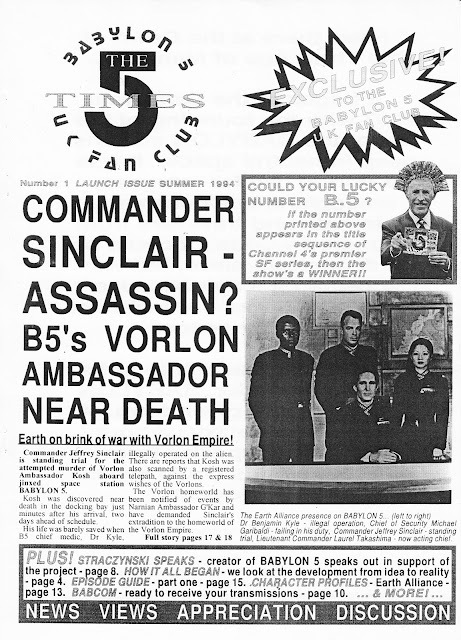 This A4 black & white first issue mainly covered the show's feature length pilot... which turned out to be pretty different to the show that followed. From this (relatively crude) DTP start, the club and the newsletter progressed onto bigger and better things over the course of the next few years. I'm not sure they ever had the official backing of the studio (as that probably would have required a license and cash transactions) but it did have the support of the cast, crew and US fan club. Which made it all-but-official as far as I was concerned. How will I be marking the aniversary? In what sounds like the best way possible: a big screen (a 70mm print no less) outing of STAR TREK II: THE WRATH OF KHAN. It'll be the first time I've seen my favourite Trek on the big screen since it was first released back in 1982. Frankly, I can't wait. From 1995: The VHS cover for the fan-produced tape AN AUDIENCE WITH THE COMMANDER, signed by its late star MICHAEL O'HARE. The Movie Palace was a coffee shop/ geek shop/ venue space located just off Tottenham Court Road in Central London. I attended several events there in the mid-nineties, including the launch event for this tape. 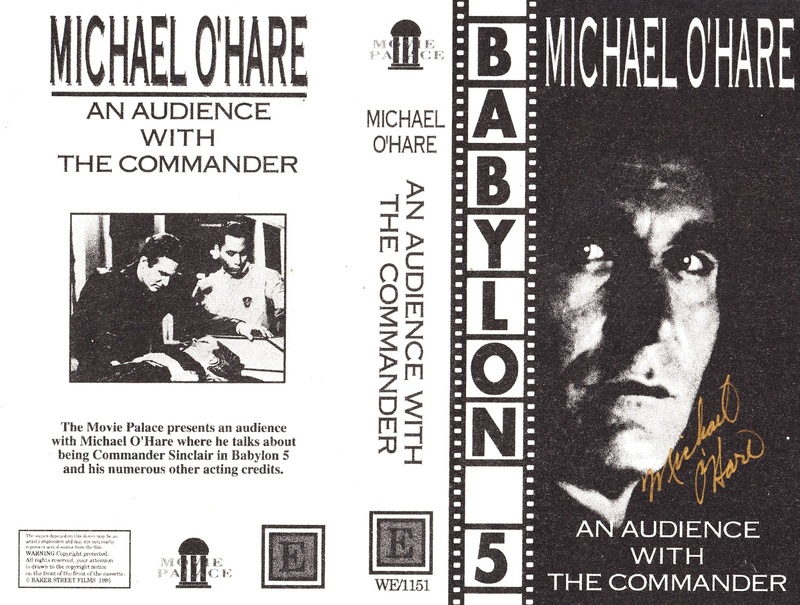 The interview tape was shot sometime earlier (I'm not sure if the original location was The Movie Palace or a convention) but the tape was launched with a signing by O'Hare and a screening in TMP's upstairs screening room. The video itself is standard bloke-on-stage stuff and probably shot on VHS to begin with. By the time it had been edited and duplicated, the production standards weren't looking great. I've long since dumped the tape but I did dub it onto DVD first. I found O'Hare himself to be polite and friendly but somehow detatched. Much like his performance on the show to be honest. It was no great surprise that Warner Brothers opted to replace him with a more established (and bankable) TV star like Bruce Boxleiter. Although it has subsequently transpired there was more to his replacement than just Hollywood business. He died in September 2012 after suffering a heart attack at the age of sixty. From 1977: Marvel's done-in-one adaptation of the movie THE DEEP. 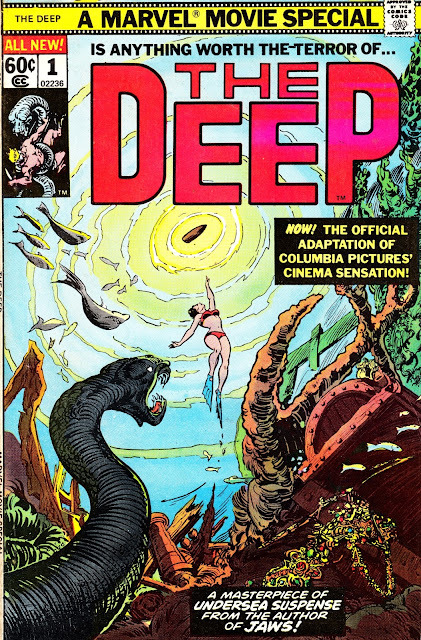 The movie was adapted from the novel by Peter Benchley, starred Robert Shaw and was set in the sea... so it came with JAWS-sized expectations of a runaway blockbuster. Presumably that expectation, and the opening scene, propelled it to becoming the 8th higest grossing movie in the States that year. Having seen the movie far more recently, I can report that lightning did not strike the ocean twice and this was - in fact - no Jaws. From late 1997: a house ad for STARBURST VIDEO VOLUME 3, the last in the series of straight-to-tape 'editions' of the magazine released by publisher Visual Imagination. I've never seen the first volume (fronted by Jon Pertwee and released to celebrate the 200th edition of the magazine) but I do have copies of the second and third (albeit long since dubbed onto DVD and the original VHS tapes dumped). They both follow the same formula: various short (and not very candid) interviews with genre types (often snatched on location... presumably during conventions or promotional appearences) linked together by a celeb better known for acting than presenting. There's plenty of links that flow with all the confidence and spontaneity of someone reading from cue cards. George Takai beamed in for the second tape, shooting his links at the STAR TREK exhibition staged at London's Science Museum (I went!) whilst - for this tape - BABYLON FIVE's Bruce Boxleiter wandered the halls of The Sci-Fi Channel's new London base. That location choice was clearly one that seemed better on paper than it looks on the screen. The sad fact is thst most TV stations, except for the studios (if they have any), galleries and (sometimes) edit suites, look just like any other pokey office building once you pass the fancy reception. And it's clear - in the case of this low-budget start-up, they didn't even have a fancy reception. I have a strong suspicion that Visual Imaginatiin were simply taping the rushed interviews that turned up across their range of magazines (which was pretty much at their peak at this point) so a canny viewer with time on their hands would probably be able to spot where the print versions of all the content here appeared. Possibly several times as VI seemed to spread suspiciously similar content across the whole range. Visual Imagination are now defunct (although STARBURST lives on) so these tapes are long unavailable. They were never issued on DVD and it's unclear what happened to both the finished masters and the original rushes once the company folded. 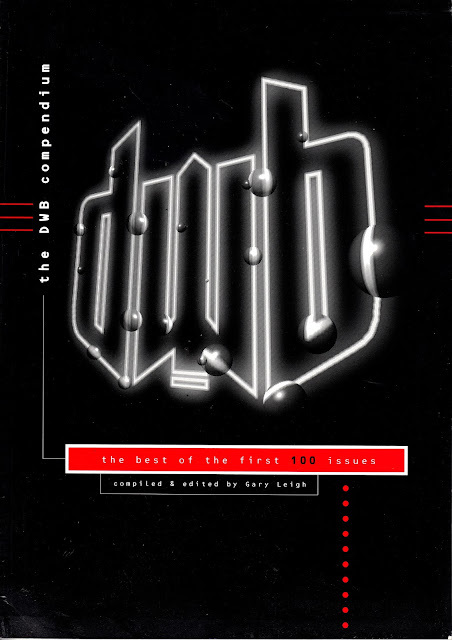 If anyone has a digital copy of the first volume, I'd be very interested in seeing it. From December 1991: Marvel USA followed-up THE DESTROYER black & white magazine (see post previous) with this more traditional (IE slightly more likely to be stocked in comic book stores... and noticed by would-be readers) comic book limited series. The REMO WILLIAMS film is now available on shiny BR disc... and well worth revisiting. Or - more likely - seeing for the first time. 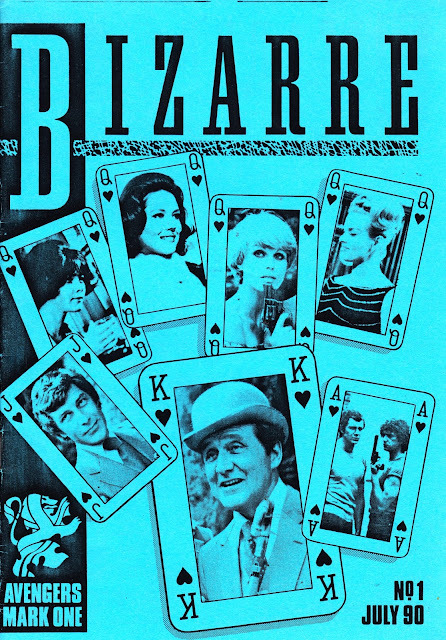 From July 1990: the first issue of BIZARRE, a British AVENGERS (of the TV, not comics, variety) fanzine named after the show's last episode. 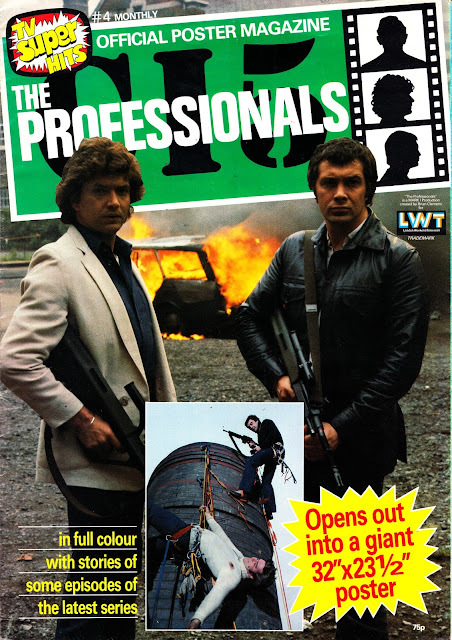 As the cover design suggests, it also devoted space to THE NEW AVENGERS and THE PROFESSIONALS: two Seventies action shows from the same creative stable.